I live in a quiet neighborhood in Metro Detroit. The houses are small and built close together. There are only a handful of floor plans in the square mile subdivision. Every house has a tree in front, between the sidewalk and the street. I imagine most of them were planted when the houses were built in the early 1960’s. Most of them are now large and provide an abundance of shade. The shade makes an early morning run in the summer very pleasant. Many of the homes are still occupied by the original owners. Retired now, they are not rushing off to work in the morning, adding the the peace and quiet. happening. 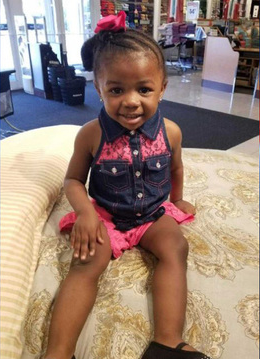 Sondra Renee, a pretty two-year-old girl from Detroit, had reportedly been abducted at gunpoint by her mother’s boyfriend. I saw a picture of her, the alleged abductor, and a description, with license plate number, of the vehicle he made his getaway in. I couldn’t help thinking of my 5 grandchildren, 2 of whom are the same age as little Sondra Renee. I shared the Amber Alert on Facebook and said a prayer for her safe return. Happily, after a few hours and a high speed chase, the kidnapper was in custody and Sondra Renee was safe and unharmed, at least physically. I don’t know if the Amber Alert was instrumental in finding the little girl, but she was no longer in imminent danger. An Amber Alert, as you probably know, is a big deal. It is broadcast to cell phones, posted on social media and reported by the local media. People are deeply concerned when they learn of a little child in grave danger. There are millions of children in grave danger throughout the world, simply because they do not have access to clean water. 1000 of them die every day from diseases like diarrhea, something we think of as an occasional annoyance. Maybe it’s because they are far away, or maybe it’s because not many people in the west are talking about them, but there is no Amber Alert system to help rescue these kids. Yet every one of them is as special and as precious as Sondra Renee. World Vision is the largest non-governmental supplier of clean water in the world. They are bringing sustainable clean water sources to millions of people each year – one every 10 seconds. They want to accelerate the pace until one new person is receiving access to clean water every 10 seconds. They want to end the global water crisis by the year 2030. And they believe it can be done. It is an honor and a privilege to be a member of Team World Vision, a major source of funding for World Vision’s water projects. We run to raise money so kids won’t have to die from drinking dirty water. We want to be the Amber Alert system that helps rescue children from imminent danger. This is why I am training to run the Chicago Marathon this October.